Another school year in Spain has come and gone, and right now I’m back home in Texas with my family and working to save money while I get ready to return again this fall. Last summer, I wrote what I thought about the North American Language & Culture Assistant program, which allows recent college graduates like yours truly to teach English in Spain. That review was based on my experience working in an elementary school in rural Andalucía and living in an off-the-beaten-track, mid-sized town called Úbeda. 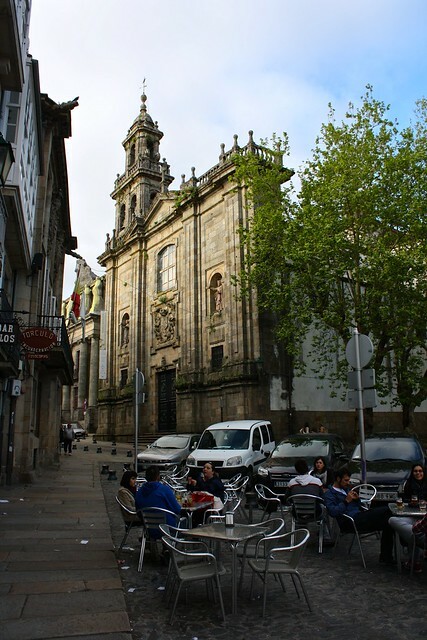 Having worked at another elementary school in coastal Galicia and lived in the regional capital of Santiago de Compostela this year, my opinions of the program have become more nuanced, although they are still generally positive. 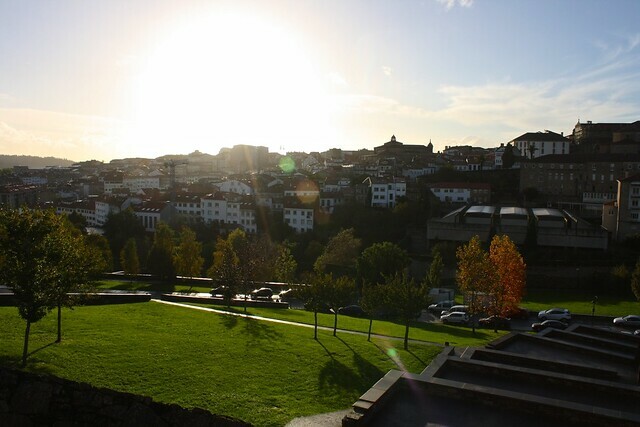 Since I’m going back to the same school in the fall, I find myself at the midpoint of my time in Galicia (northwest Spain): a perfect time to reflect on my experience in this program. A quick refresher: the auxiliares de conversación program is sponsored by the Spanish government—the Ministry of Education, Culture, and Sports—but because the autonomous communities are ultimately responsible for education, language assistants report to the regional governments. In exchange for working 12 hours a week in Spanish public schools, assistants receive 700 euros a month and health insurance, and get time off during school holidays. (FYI: in the Community of Madrid, they work 16 hours a week and get paid 1000 euros a month.) These auxiliares work in preschool, primary, secondary, or adult-level classrooms and assist teachers in English-language education, but experiences vary widely. First, I’ll talk about my time in Galicia and my coastal elementary school, and then I’ll tell you my thoughts about the program in general. I’ve discussed in depth teaching English on my previous posts about my school and a typical “day in the life” of an assistant, but suffice it to say this year was very, very different. Whereas two years ago I basically showed up to class and followed the lead of the head teacher in the room—be it reading from a textbook, reviewing vocabulary, or managing the smart board—this year I did a lot of real-deal teaching on my own for the first time. Because my school is so small, there’s only one full-time English teacher (and the rest of the teachers don’t actually, uh, speak English), so in eight of my twelve teaching periods I was responsible for giving that class’s English lesson for the day. When Fran, my bilingual coordinator, told me I would be leading a lot of English classes this year, I kind of freaked out at first since I hadn’t done anything of the sort the year before and our job description as assistants kind of precludes that. But in the end it wasn’t a big deal at all and I grew a lot personally. Every Monday morning, we sat down and planned my classes for the week: what textbook pages to focus on, which activity book questions to assign, ideas for games and songs, etc. I had a few days to “shadow” her classes to see how she handled things and then I was basically turned loose (but not really, since the grade-level teacher was always present to keep rowdiness under control or explain directions). This year I exclusively worked in English-language classes, another change from my school down south. Two years ago, I was really only in a few proper English classes, and actually worked mainly in science classes that were taught in English. (Hello, words like viviparous, ulna, and condensation!). Also, while in Villanueva del Arzobispo I endured the kindergarten class from Hell, this go-round I was in charge of the entire preschool program in Abanqueiro. Sounds scary, but it was just three classes and I was provided with an extensive curriculum—and super-adorable kids who really caught on fast. My first year in the program I lived in Úbeda, a mid-sized city of around 35,000 people, and commuted to the village of 8,000 my school was at. 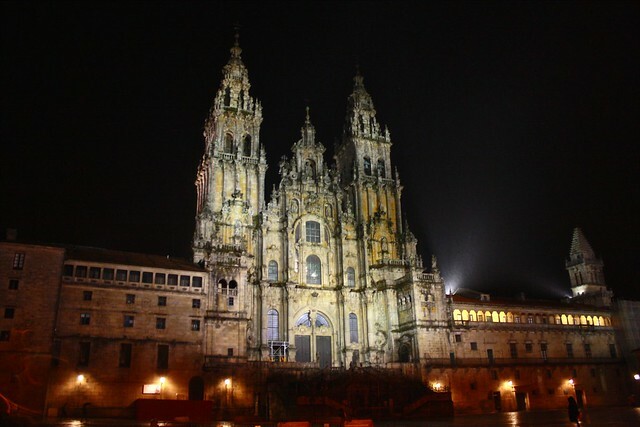 This year, I lived in Santiago de Compostela, the nearly 100,000-strong city of pilgrimage and university fame. 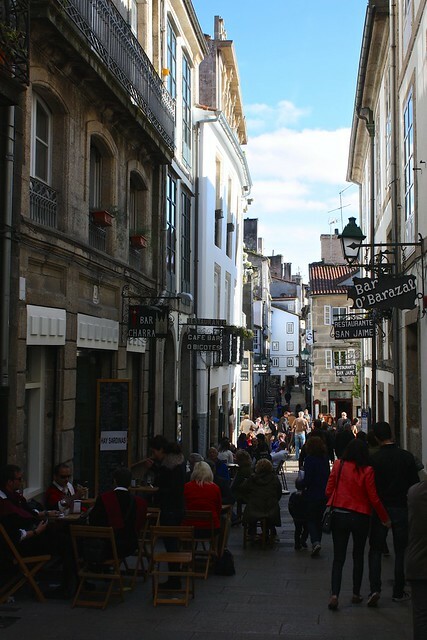 It was a smart decision to live in the capital of Galicia and commute two hours each day out to the coast, because the bustling city, simply put, had so many more opportunities than the municipality Abanqueiro belongs to, Boiro. A few dozen fellow English-speaking auxiliares also chose to live in Santiago, a real blessing because this gave me an immediate community to plug in to once I arrived. From Thanksgiving potlucks to hiking daytrips, having like-minded friends who simply got you made all the difference in enduring the dark, cold, rainy winter. It’s hard to overestimate how much I fell in love with Santiago de Compostela; this beautiful, perpetually-glazed-with-rain city was just the change I was looking for after living in southern Spain for a year. Santiago’s sprawling cathedral complex is one of the most interesting I’ve seen in all of Europe, and its World Heritage-listed granite streets offered endless churches, museums, and restaurants to check out on the weekends. Free tapas with my drink and high-quality food in the Mercado de Abastos kept my hunger at bay. And my allergies drastically improved since Santiago has dozens of parks and green spaces to go walking in. In Santiago, I ended up living with another American in the program, Noé, who I met while going out for dinner with the other assistants during the apartment hunt. 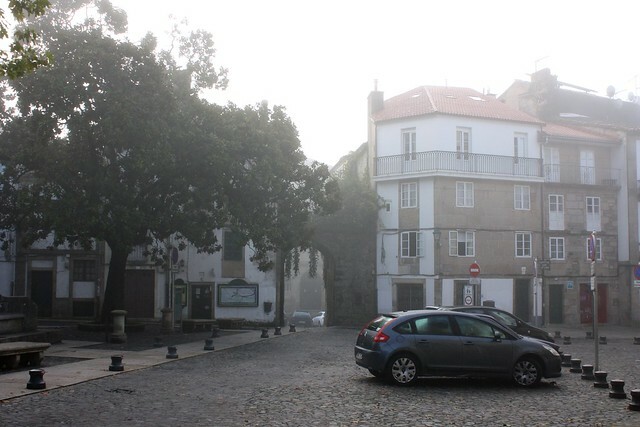 The two-bedroom apartment we signed for couldn’t have been in a better location: right outside the old town where a bajillion bus routes went by, but on a quiet residential street that took us down to a sprawling, glorious city park. 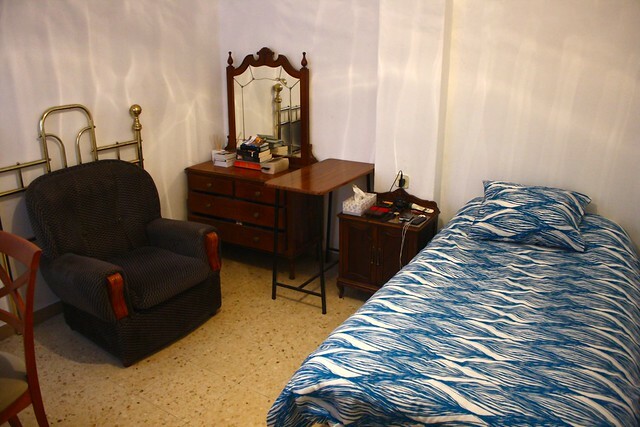 Our rent, at 350€/month, was about average for a city outside of Madrid. And praise God that the place came with a dehumidifier; otherwise, our laundry would probably never have dried here in rainy Galicia. Living in northern Spain made it easier to explore a whole ‘nother side of the country I didn’t get to see last year in southerly Andalucía. Highlights of my travels this year include: checking out all four provinces of Galicia, flying over to Italy to see Florence, Siena, Rome, and Pompeii, running around the region of Aragón, tracing the Camino de Santiago through the province of León, and visiting Galicia’s long-lost cousin to the south, Portugal. 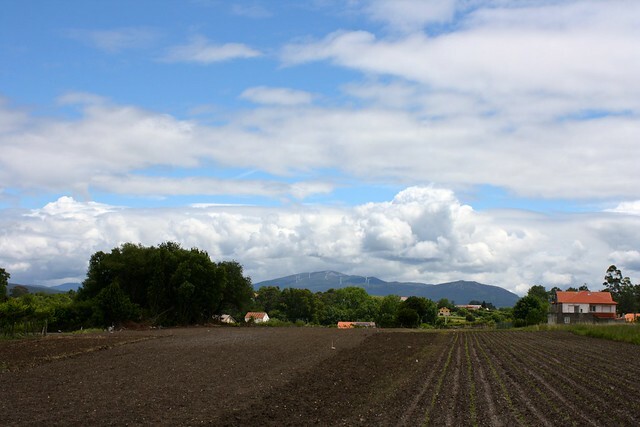 I’ll be the first to admit Galicia is a far-flung part of the country, but highways and railways cross the region just like they do any other part of Spain, so it’s easy to hop on a bus or train and be in Madrid in half a day. The western coast of Galicia is home to not one but three different airports, but I only ever found cheap enough flights from Santiago’s airport to visit Sevilla. It was actually cheaper for me to ride Promo-price all-day trains to Barcelona and from Madrid when I flew to Italy instead of flying from Galicia there…oh well. Spain is a little bit smaller than the state of Texas but has about twice the population, and in contrast with France to the north, the country is a very decentralized state. Each of the 17 autonomous communities, for example, are directly responsible for education, so within the guidelines that each successive political party passes when they’re in power, the regions are in charge of hiring and firing teachers, choosing the curriculum, and—you guessed it—coordinating the more than 2,000 language assistants that come to Spain each year. Although the Spanish Ministry of Education sponsors the teaching assistant program, apart from placing us in our respective regions and throwing money our way, there’s very little the central government actually does—there’s not even an official How To Use Your Language Assistant guide, so things can vary a lot from region to region. I was blessed with a responsible school my first year that paid me on time every month, but other assistants in Andalucía weren’t nearly as fortunate; a few folks had to wait until mid-December until their paycheck for work in October finally came through. There are always horror stories about payment issues coming out of Murcia, but I can report nothing but good news here in Galicia. Once the Xunta de Galicia had everyone’s bank information, they paid us on the first business day of the month or earlier every month of the school year. Bravo, Galicia. Bravo. Those of us who work in Galicia have come to a consensus that they have the best-run program in the country here. Government big-wigs attended the big auxiliar orientation at the beginning of October, and Elena, the functionary in charge of the program in Galicia, has always helped us out with any school placement or bank issues we have had. Whereas in other regions the government officials can be unresponsive, fickle, or outright hostile to their assistants, I give two thumbs up to how the Xunta (regional government) has organized the program. But, like I said in my original review, not everyone is lucky enough to get placed in a good school with teachers who help them out and let them ride in their carpool from a larger town. Not everyone is lucky enough to get placed within commuting distance of a major, trendy city with a bus station, train station, and airport. And not everyone is lucky enough to be able to travel as much as yours truly did, simply because of the logistics of living in an isolated pueblo or the difficulty of making 700€ last the whole month. I’m gonna be blunt and say that risk is a fundamental characteristic of this program. You take a risk when you apply that you might get placed in Galicia, Asturias, or Castilla y León, or in none of the above. You take a risk that you might work in an elementary school or a high school, or even adult language school—it could be preschoolers, their parents, and everyone in between. You take a risk that you might get placed in a bustling metropolis with tons of fellow English-speakers…or in a tiny hamlet with no public transportation links to the “outside world.” You’re likely to have a wonderful year wherever you end up, but it’s still a possibility you could get the short end of the stick. Even though it’s frustrating how chance/fate/destiny/the hand of God can determine a lot of how your year goes, your attitude actually plays a big part in your experience, too. You might have dreams about living in the next hip neighborhood of downtown Madrid or sunbathing on Andalusian beaches after work every day—and then be crushed to learn you’ll be packing your bags for middle-of-nowhere, landlocked Extremadura. I’ve seen a lot of people on the Facebook groups whine about how they desperately need to switch regions to get to Madrid, or even worse, complaining that their school is in a distant village in the region of Madrid instead of the capital’s city center (not making this up). You’re not entitled to anything in this program apart from a paycheck, health insurance, and paid holidays, and your regional and school preferences are just that—preferences, which the governments may or may not take into consideration. Yes, it can be a major let-down when you open up your placement letter and read *insert fail trumpets here* you’ll be working at an elementary school when you requested a high school…and at a tiny village when you requested a big city. Trust me, I’ve been there (twice! ), but I’ve learned to adopt the Spanish no pasa nada lifestyle of no worries. In both of my initially-disappointing school placements, things turned out for the best and I had a good year nevertheless. A final reminder: if you stick it out through a less-than-desirable assignment through your first school year, you’ll have priority as a renewal and can basically get your dream school when you apply for a second year. Liz Carlson of Young Adventuress transferred out of a crappy situation in Córdoba and had the time of her life in northern La Rioja, and one of my close friends in Úbeda moved across Andalucía to the happenin’ capital of Sevilla. The auxiliares de conversación program is a great way for native speakers of English who have recently graduated college to live abroad in Spain. You get paid a living wage and health insurance, you have lots of opportunities to travel and practice speaking castellano, and you don’t need expensive qualifications or have to spend all your time lesson-planning and grading papers. Becoming a language assistant in Spain, however, does involve a lot of risk because you essentially “go potluck” with your region and school placement, which can really decide if you have a good or a bad year. It’s not out of the ordinary for folks to head back home after a crappy year, but I personally have had a positive experience both in the south and up in Galicia. If you’ve ever been an auxiliar de conversación before, how does your experience compare to the one I’ve just described? Add your thoughts to the discussion below!